Live Laugh Decorate: A Baby and a Foot in the Face. A Baby and a Foot in the Face. Our 'lil man stopped sleeping in his crib when he was about six months old. Screamed like a madman when we put him there. He's kind of a free spirit and we think the sight of those railings just freaked him out. Anyhow, since his nursery also doubles as Grandma's room (we've been blessed to have her stay with us in lieu of sending him off to day care) he now sleeps in the bed with her or either one of us when grandma is home in D.C. 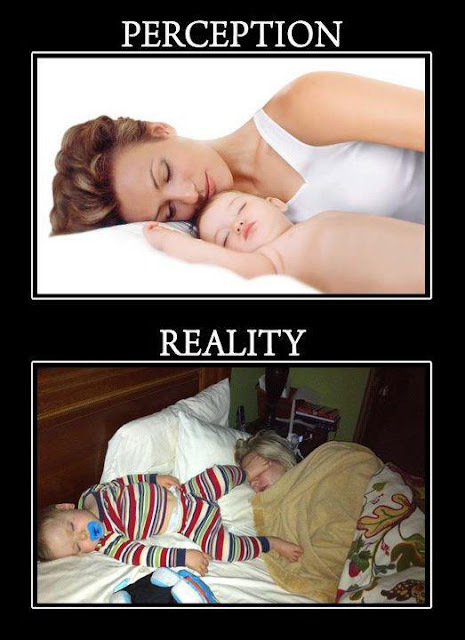 I think these photos pretty much sums up what every parent experiences when they first cuddle up with a baby, and what they wake up to. That's what I dealt with this Labor Day Weekend. A foot in the face and a kid who now tackles you to get the food on your plate - just ask Debbie who had to hide her plate of ribs from this 'lil dude. Speaking of labor, there was a lot of labor involved this weekend as I broke my self imposed, "no work on a Sunday" rule to whip together a last-minute office design project that needed to be done in 48 hours. More on that to come.Anywho, happy, happy Tuesday everyone. This is really amusing. They are really cute at this age. Me either, especially since they grow up so fast!